The Lost Tribes - Development Journal: Success! YAY! Okay, fine, my technology model is a wee bit too complicated ... but my engine successfully created a manufacturing network capable of generating Surface Transports, and it only takes a player 4 game years to do it. Seems like a long time, but 4 game years, doesn't seem unrealistic, but it's early and the models aren't even tuned. Once a player can create a Surface Transport, they can travel up to the space station, and begin the next stage. This is a major developmental goal. Largely it means that development on the planet is complete, at least from a major delivery perspective. 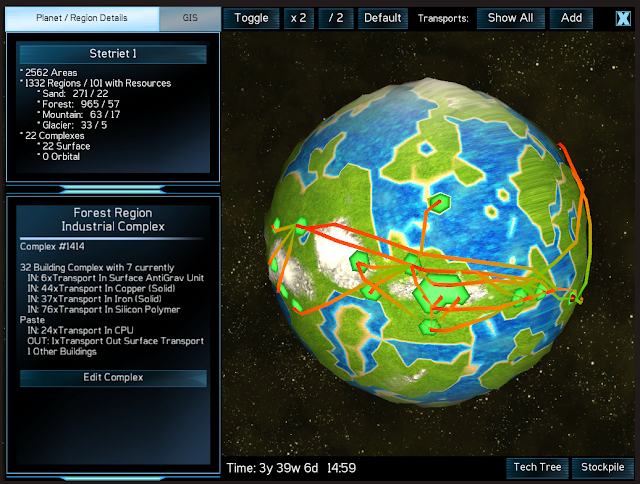 There will be other planet related changes, but now I can move on to developing the space station bit. Next week! I need a break.